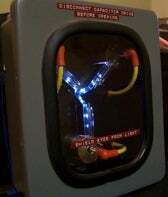 At this writing, you have just over 24 hours to go over to eBay and snag yourself a Flux Capacitor. The high bid right now is $500, which is a steal for a bleeding time machine . Of course, you'll need a DeLorean to go with it—nobody puts a capacitor into a Honda Civic, dude, spinning rims or no—but hey, once you have the capacitor, you're all set, right? I mean, sure you're shelling out five C's on the sucker, but after you get it, you can always just jump back to earlier in the week and grab it for cheaper, am I right? Eh? Eh?